The signature greenspace that anchors the Nationwide Arena District is home to a unique piece of Columbus history. 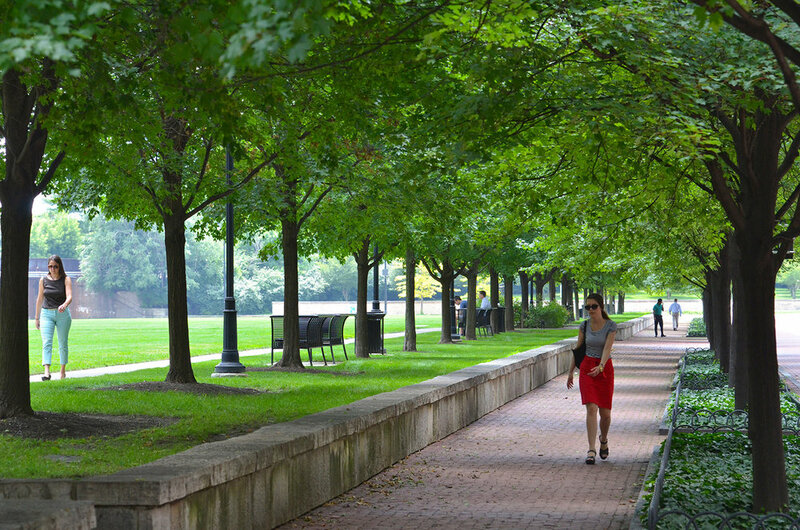 This thriving urban green space completes the link between the downtown Columbus riverfront and the heart of the Arena District, becoming a popular space for outdoor summer weddings and a preferred location for many activities and events. Originally conceived as a component of the larger Arena District Master Plan, the long, triangular stretch of green provides a calm counterpoint to the active dining and entertainment Arena District. The Daniel Burnham Arch that was salvaged from Columbus' historic Union Station is a highly visible focal point of the design. McFerson Commons is an active and valued community space, from a peaceful spot for downtown workers taking a lunch break and an open space for downtown residents and informal recreation leagues, to a viewing spot for Independence Day fireworks and an event space for concerts and seasonal offerings. Low, stone walls form a crisp border to the grand lawn and double rows of red maples provide a natural dissolve into the surrounding urban fabric. As a direct result of this urban green space, private sector-led mixed use development has significantly increased the value of adjacent land.